In 93 cases, “a reasonably certain diagnosis was eventually possible.” 6 of the 7 undiagnosed patients ultimately made a full recovery. Underlying etiologies (see table 1 on page 3) included: infectious 36% (with TB in 11%), neoplastic diseases 19%, collagen disease (e.g. SLE) 13%, pulmonary embolism 3%, benign non-specific pericarditis 2%, sarcoidosis 2%, hypersensitivity reaction 4%, cranial arteritis 2%, periodic disease 5%, miscellaneous disease 4%, factitious fever 3%, no diagnosis 7%. Clearly, diagnostic modalities have improved markedly since this 1961 study. However, the core etiologies of infection, malignancy, and connective tissue disease/non-infectious inflammatory disease remain most prominent, while the percentage of patients with no ultimate diagnosis has been increasing (for example, see PMIDs 9413425, 12742800, and 17220753). Modifications to the 1961 criteria have been proposed (for example: 1 week duration of hospital stay not required if certain diagnostic measures have been performed) and implemented in recent FUO trials. 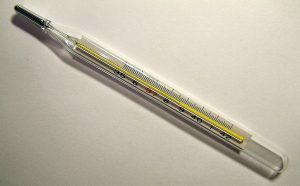 One modern definition of FUO: fever ≥ 38.3º C, lasting at least 2-3 weeks, with no identified cause after three days of hospital evaluation or three outpatient visits. Per UpToDate, the following minimum diagnostic workup is recommended in suspected FUO: blood cultures, ESR or CRP, LDH, HIV, RF, heterophile antibody test, CK, ANA, TB testing, SPEP, and CT of abdomen and chest. 5. “Robert Petersdorf, 80, Major Force in U.S. Medicine, Dies” The New York Times, 2006.